One of the most enjoyable outdoor activities during the summer is to go boating. Boating is a great way to bond with friends and family members. If you don't own a boat, you can join one of our boating clubs and have access to kayaks and sailboats for member use. There are several boats to choose from and many activities to participate in while on the water. Below are just a few of the great things you can spend your day doing while boating. Relaxation - Many families will take a cooler and snacks, sit back and enjoy the peace that you can experience while floating on the water. Fishing - Take your kids, grandkids, friends and family out for a day of fishing. Not only will you have blast watching the young ones eyes light up when they catch a big one, but you will also be able to spend that quality time together that everyone deserves. Sailboats, Kayaks, Canoes, Rowboats, Paddleboats and Windsurfers are welcome on our breezy lake. This summer head to the water with your family and friends and enjoy your time together. 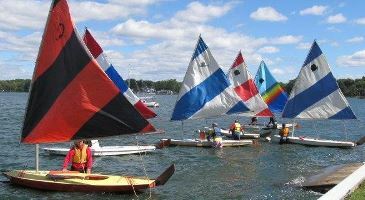 Lake Members can also join the Sailing Club and/or Kayak Club.